Charlie Kennedy, from Aberlour, has long harboured dreams of becoming a top-class goalkeeper. Despite being the smallest in his class, the 11-year-old’s huge passion has also pushed him to compete in golf, tennis, swimming, hockey, kayaking and curling. Now the Aberlour Primary School pupil has filmed a video with his dad Gordie to highlight the range of sport facilities on Speyside. 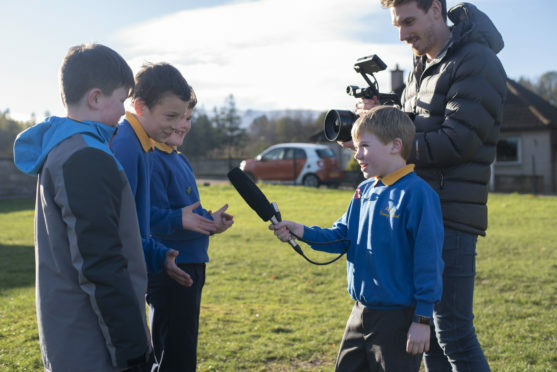 His video tour of Aberlour has now won him the chance to become a young reporter on the red carpet at next month’s Pride of Sport Awards in London, which celebrate unsung heroes from across the country. The youngster also hopes to inspire others his age by telling them that size should be no barrier to pushing themselves to the limit. He said: “Being the smallest doesn’t stop me trying to be the best I can be in all of the sports I compete in. When I play sport I think people forget that I’m small. Charlie Kennedy interviews his classmates at Aberlour Primary School. “I want to be a goalkeeper, even though everyone says I’m too small. It doesn’t stop me. I train harder and work harder than everyone else to be the best. “Sport for me is confidence building and helps give me a positive outlook in life. Judges of the Pride of Sport contest, which is organised by the TSB bank, praised Charlie’s enthusiasm for sport as an example for others to follow. Stuart Gray, TSB’s area director for Highlands and Islands, said: “Sport is about living and breathing the values of resilience, fair play and working together and Charlie is a great example of that.